Runners from every state and 60 countries ran with the Marines and actor J.W. Cortes. in Oct. 22's Marine Corps Marathon and the MCM 10K. Cortes, who portrays Detective Carlos Alvarez on the FOX Network television show, "Gotham," was the official MCM starter and sang "God Bless America" at the Washington D.C. start line of the 10K. He then took a deep breath and began the 10K event, a companion race to the 26.2 mile race, toward the Marine Corps War Memorial in Arlington, Va. The actor talked to the media Oct. 20 at National Harbor's Gaylord National Resort and Convention Center during the event's annual press conference. He military reporters and Washington, D.C. media members of his pride and the honor of being a Marine and his participation on marathon weekend. "It is probably one of the most distinct pleasures and honors of my life having served in the Marine Corps, (and it) has given me the intestinal fortitude to come back here and to want to suffer with each and every one of you while running the marathon and 10K," Cortes said in his opening statement which produced laughter. On race day, Cortes finished the 10K in a time of 49 minutes and seven seconds. The Brooklyn-born actor served 13 years in the Marine Corp with deployments in Operation Enduring Freedom and Operation Iraqi Freedom. 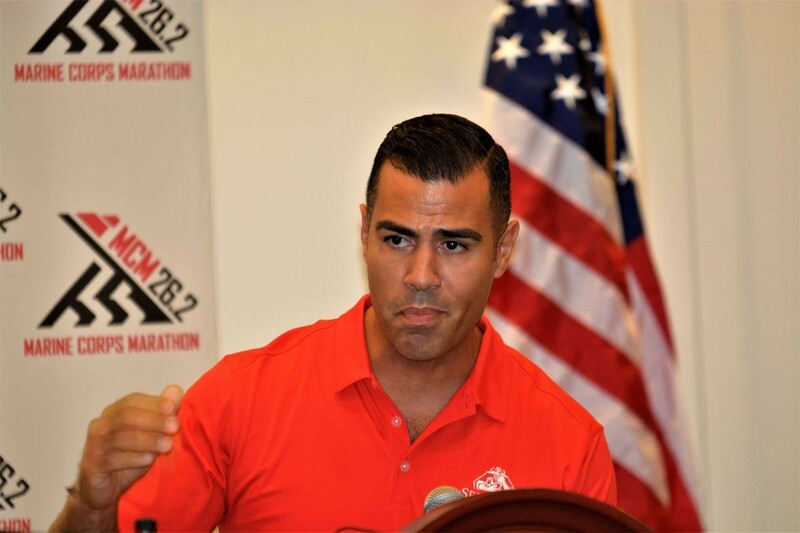 Cortes is scheduled and training to run again as a member of Team Semper Fi in the New York City Marathon Nov. 5. Team Semper Fi is a part of The Semper Fi Fund, which works to provide financial assistance and support to the post-9/11 combat wounded and injured members of the military and their families. Other past celebrity starters of the Marine Corps Marathon include comedian and game show host Drew Carey in 2011, actress Maggie Q in 2013 and actor Sean Astin in 2014.